ZEBULON, N.C. - Dallas Carroll hit a three-run home run in the fourth and a solo shot in the sixth, Cooper Hummel hit a two-run homer in the eighth and Christian Taugner turned in a quality start as the Mudcats defeated the Astros 7-5 in the final home game of Carolina's 2018 season at Five County Stadium. 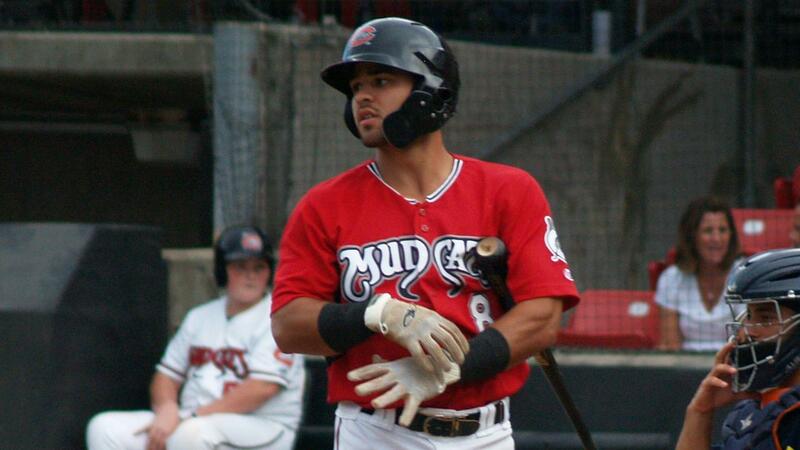 The Mudcats (65-71, 31-35) totaled 13 hits in the game with eight going for extra-bases, including doubles from Hummel, Devin Hairston, Joantgel Segovia and Rob Henry. They also had a triple from Henry and home runs from Carroll and Hummel. Carolina also totaled a season high 11 walks in what was the final home game at Five County Stadium in 2018. Hummel drove in the first run and final two runs of the game while going 2-for-4 with two runs and three RBI. He forced in the first run of the game with a bases loaded walk in the second and later hit a two-run home run in the eighth. The Astros (78-57, 41-25) did managed to take a 2-1 lead with a couple of runs off Taugner (3-1, 4.91) in the third, but Carroll quickly gave the Mudcats the lead again after hitting a three-run home run in the fourth. Taugner also allowed a run in the fifth, but finished his quality outing with three earned runs allowed on six hits while earning the win. He also walked two, struck out two and reached 95 pitches (64 strikes) in his final start of the season. Carolina led 4-3 entering their half of the sixth, but would go up by two again when Carroll hit a line drive home run the opposite way to right. The home run was his second of the night and his seventh of the season. Hummel's home run in the seventh, meanwhile, was his eighth and gave the Mudcats a 7-3 lead late in the game. Reliever Alec Kenilvort followed Taugner and went on to work through two scoreless frames with two strikeouts while earning his seventh hold of the season. He was later replaced by Luke Barker who pitched around a two-run single from J.J. Matijevic in the ninth while finishing off the victory. Barker allowed two runs on two hits in the ninth, but finished with three strikeouts. Cristian Javier started for Buies Creek and allowed Hummel's bases loaded walk in the second that gave Carolina it's early 1-0 lead. Javier finished with four walks, four strikeouts and one run allowed on two hits over an inning and 2/3. Relievers Colin McKee, Tommy DeJuneas and Enoli Paredes also appeared in the game for the Astros and combined to allow six runs between the fourth and seventh innings. McKee (3-2, 4.17) allowed Carroll's home run in the fourth and finished with three runs allowed on four hits over and inning and 2/3 while taking the loss. He also walked two and struck out four. DeJuneas gave up Carroll's home run in the sixth, but the NC State product finished with just one run allowed on three hits over two and 2/3 innings. Paredes pitched part of the seventh and left after issuing three straight walks immediately after allowing Hummel's two run home run. Buies Creek eventually turned the game over to centerfielder Jacob Meyers as he took over for Paredes in the eighth and finished the game. Seth Beer drove in both Buies Creek runs in the third and was 1-for-3 with two RBI in the game. Osvaldo Duarte hit a run scoring double in the fifth and was 1-for-3. Matijevic went 1-for-5 with two runs and the two-run single off Barker in the ninth. The victory evened the split four game set at 1-1. The series will next shift to Buies Creek with the first pitched scheduled for 2:00 p.m. and Jim Perry Stadium at Campbell University. NOTES: Cooper Hummel went 2-for-4 with a two-run home run, two runs, three RBI and two walks while raising his Carolina League leading on-base percentage to .394 for the season... Dallas Carroll set a new career high with two home runs in the game. He also matched a season high for RBI with four.